My haul! I am a fairly new, quite inexperienced book collector... but a lifelong inveterate packrat, and someone who cannot pass up "a bargain". Thus, I have shown some sense by generally avoiding auction. But you have to have a bit of fun, once in a while, don't you? And that's exactly what I did on 11 July, 2013, when I went to a very well run auction at Henry Adams, Baffin's Lane, Chichester, Sussex. Now... it must be said that without exception, they are in pretty dreadful condition. And thus, probably not worth a great deal... except as some things "fun", and as an exercise in "what might have been". (Of course, had the condition been different, the interest from other buyers would, no "might" about it, have been different.) 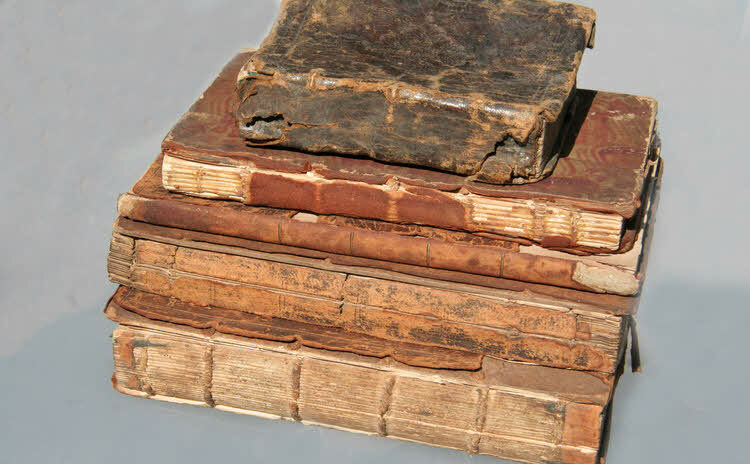 But, damaged or not, these books are quite old. Where did they come from? Where have they been? How did they come to be together in one job lot, at the sale in July, 2013? (The sale was a general sale... furniture, 2 and three dimensional art, some clocks, some microscopes... all sorts of things! (Just a few books). It was interesting to me that they were all more or less equally battered and damaged. A dealer getting rid of "these will never sell" duds? But I prefer to think that they spent at least some time together with one, perhaps not very careful, owner. Or maybe they were the "collection" of someone who liked old things, but didn't want to invest a lot of money? Or maybe they were collected together many years ago, when less damaged, but remained in one family for many years, getting varying respect from each generation of curators? Of course, "if only they could talk" is one of the fun things in book collecting. Book "a": A card inside it says that this is a Christian prayer book, from the early 1700s. I can't be entirely certain... it is that good... but I think that the book is hand written. This is particularly amazing considering how many pages it has. It, unlike most books in the lot, is in pretty good condition. Not "fine"... but not falling apart! I have produced a subsidiary web page about this book with higher resolution images of a few pages, for your delight... and because I am hoping someone can help with a translation, if only of the first few lines of each page. Details there. Book "b": I should also mention that the ordering of the books here is more or less random... I didn't pick out "the best for first". And I should mention that my comments on subsequent books will not be anything like as comprehensive as my remarks on this, "book b". If only there was as much to say about the others! Book "b" is a handwritten... beautifully handwritten... explanation of shorthand. There is what I take to be an owner's inscription: "Geo. Haworth, 1773". I have created a sub-page with details on this book. There you will find, among other things, information about a historical George Haworth, who seems a likely candidate for owner of this book. What do you make of the "squiggles" under "To the Reader"? I suspect that the author is presenting an insider's joke; I wonder if those squiggles "say something", if you know shorthand? Note how at the right hand end a tail goes past the margin line? This book was carefully crafted... curious place for an accident. At the bottom of the introduction there's a florid italic rendering... the author's, I take it. What do you think it says? STOP PRESS! Oh my! When I was first drafting this material, at this points, at 12 Jul 13, 9:10... I had "one of those moments". Big time. Thank you Google; thank you Wikipedia. Make your mind up about what the name is, unless it is too late, and you've read further, and have seen what I now think it is. I'll come back to "who wrote it" in a moment. In the book there is a great deal of sample shorthand for the student. There are also two double page spreads entitled "The While Art In One View". The second one has an additional line above that, saying "The New Short Hand"
Have you made your mind up as to the author's name? Originally, my best guess was "Mannlay". Yes, odd, but best I could do. I'd written the text to invite you to email me with thoughts on what it might say. Later, I came to wonder if the name was "Mac"-something. I put Macaulay into Google, got many hits, of course. Then tried Macaulay stenography, and got a Wikipedia article. From that, and yes, it was written before this!... "Aulay Macaulay was an 18th-century English tea-dealer, based in Manchester, who invented a system of shorthand which could be used in English and many other languages. He died on 19 March 1788, in Manchester." My guess at what the books would have been worth, if they'd been in even "good" condition didn't ascribe any value to this item, as it was such an imponderable. It still doesn't, for the same reason! On the "details" page, you will see some notes, which I hope will amuse, about the auction catalogue's description, and what I'd seen in the lot, the things that determined how much I was willing to bid on it. Not only, the day before I wrote this paragraph, was Abebooks.co.uk (or .com) telling me that Macaulay had published a book about his method of shorthand, but Abebooks.co.uk was also telling me that there were two first edition copies of Macaulay's book available, and a third edition copy at a quite sensible price. 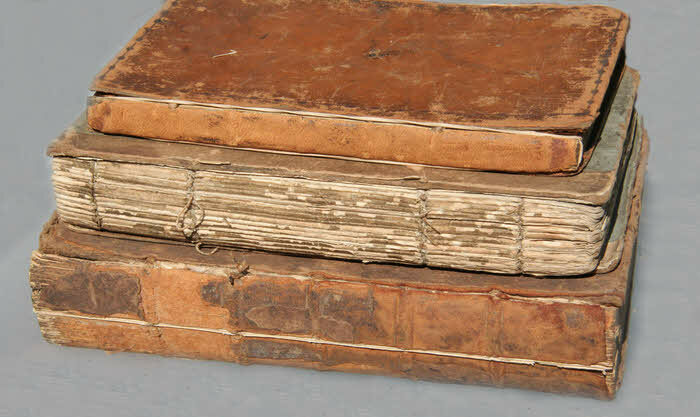 (With, alas, a deteriorated binding.) I ordered it.... about noon, as I recall. Friday. Nine thirty, Saturday morning, it arrived at my home! So: Thank you Abebooks for letting me scour the world in minutes, bookseller for processing my order remarkably quickly, and getting the parcel in the post quickly, and Royal Mail for collecting the parcel in Surrey, moving it to Sussex, and getting it into the deliveryman's bag this morning. See the sub-page about this book for more of the story. Book "c": "Forms of Prayer for the use of a Congregation of Protestant Dissenters, in Manchester. A New Edition". Printed, Manchester, by S. Russell, Deansgate, 1817". It has a touching manuscript note written in it about how this copy was used by the writer's mother during a long illness, which I infer killed her after 27 weeks. Mother born 1792, died 1846. Book "d": Cocker's English Dictionary. (The "s" being printed with the old "f-like" glyph.) Third edition, "very much Enlarged and Altered: By John Hawkins". Fairly complete, although a few final pages seem to have been lost. The last entry I have is "Zoroaster, the first King of the Bactrians". The book is about 18cm high. Book "e": Belonged to Lucy Pitkthly... perhaps when she was quite young. 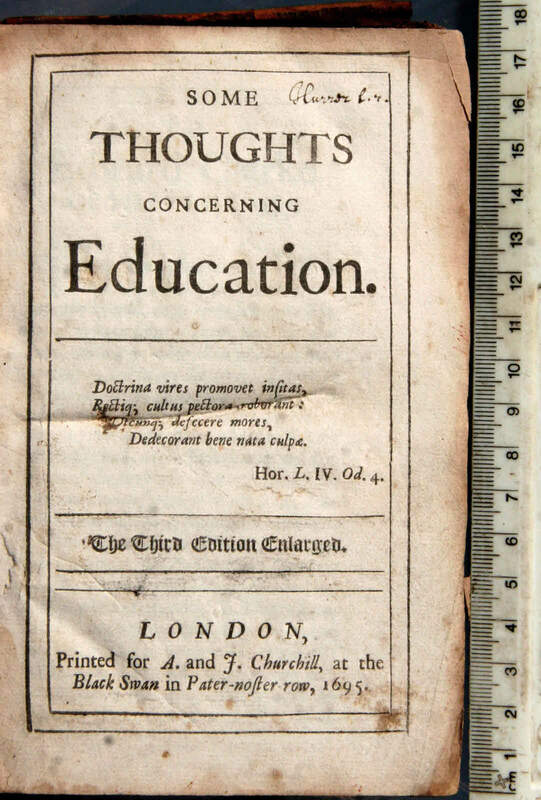 Title: "Some Thoughts On Education", "The Third Edition", "Printed for A. and J. Churchill, at the Black Swan, Pater-noster row, 1695". It is only if you are more educated than I, or if you look at the end of the dedication (to "Edward Clarke, of Chipley, Esq.") that you learn that the author of these "Thoughts" was the major philosopher John Locke, who dated the dedication 7 March, 1692"
Wikipedia will tell you a great deal about Locke, of course. Born August 1632, died 1704, so he wrote these thoughts as an old man, not so very long before his death. In Wikipedia's entry on the book, we are told that Locke was asked for his thoughts on raising children in 1684 by the man to whom Locke dedicated the book. The Wikipedia articles will tell you more of Locke's views on education. In a nutshell, he was quite liberal, and wanted children to enjoy childhood, learn through play. He was an influence on Rousseau. Book "f": A lovely little thing, and in slightly better condition than the others: "Geography For Children". The 23rd edition, as you can see, with 1802 on the title page. An earlier edition would probably be more valuable, but is it nice to know that the book was apparently well regarded. See the sub-page about this book for more images, more discussion.... and an enlarged image of the part of the map showing North America... where there are a few surprises lurking! Book "g": A rather dull printing of some Shakespeare plays, editor Isaac Reed, printed London 1809. This is volume 2of, presumably, several. It includes Midsummer's Night Dream, Merry Wives of Windsor, Much Ado About Nothing, and probably others. The book does have the minor distinction of being the "stereotype edition". Read Babbage, "On the economy of manufacture" to enjoy why that is of interest. That "In four parts" is a bit worrying... but I live in hopes that they are all within this one book, as the title page also speaks of that which takes up the latter half of what is here: "Geodesia Accurata: Or, Surveying made Easy by the Chain only". 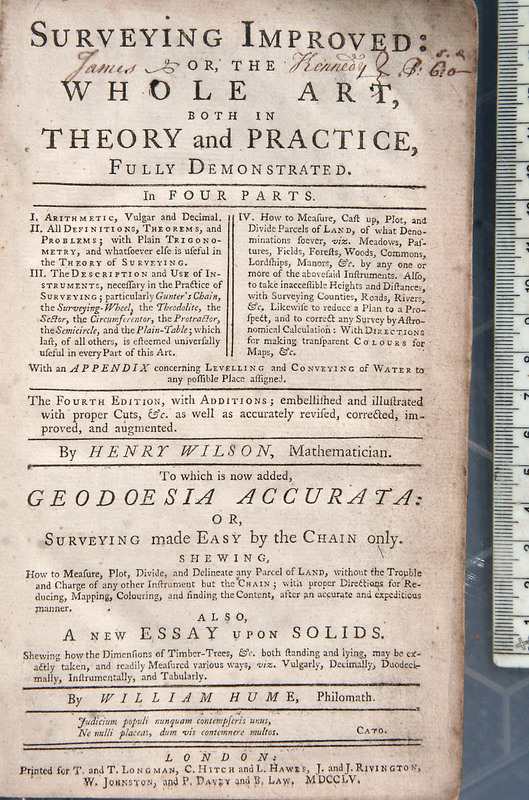 "Surveying Improved" was by "Henry Wilson, Mathematician", and was a fourth edition. 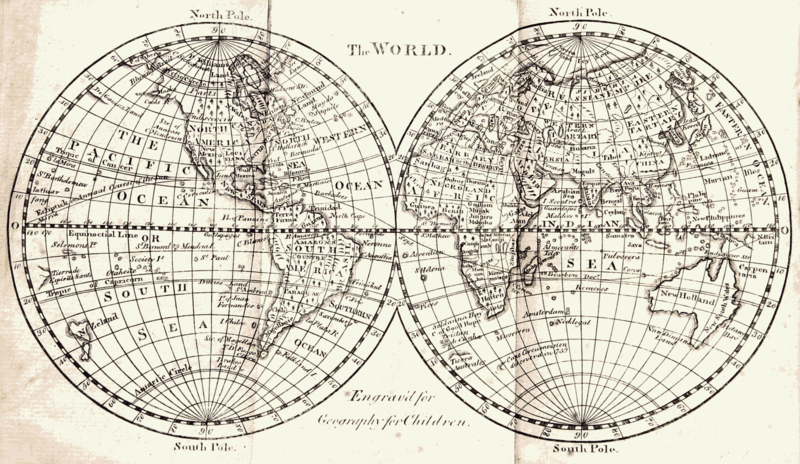 "Geodesia Accurata" was by William Hume, Philomath". (In his part of the book, there is also, it seems, "A New Essay Upon Solids". All printed in London, MDCCLV (1755?... please write an correct me, if I've got that wrong!) "Printed for" a long list of names, most of which mean nothing to me... but "T. Longman" could be the scion of today's publishing house? Plenty of lovely plates, of course, given that it is a book on surveying. See the sub-page about this book for more images, more discussion. Book "i": The first title page has the following on it: "The Works of the Author of The Whole Duty of Man, Vol. II"... "London MDCXXXII" (1632... but see below). Sadly, I don't have the companion Volume One. The second title page says "The Gentleman's Calling"... "London"... "1682". So either I mis-converted MDCXXXII, or there is a mistake... presumably in the Roman numeral. Oh well. I could find no claim to authorship within the pages of what I have, but at Abebooks, you will find it, and print- on- demand editions ascribe it to Richard Allestree. Volume One was, I believe, "The Lady's Calling". You sometimes see the two of them bound together into one book. 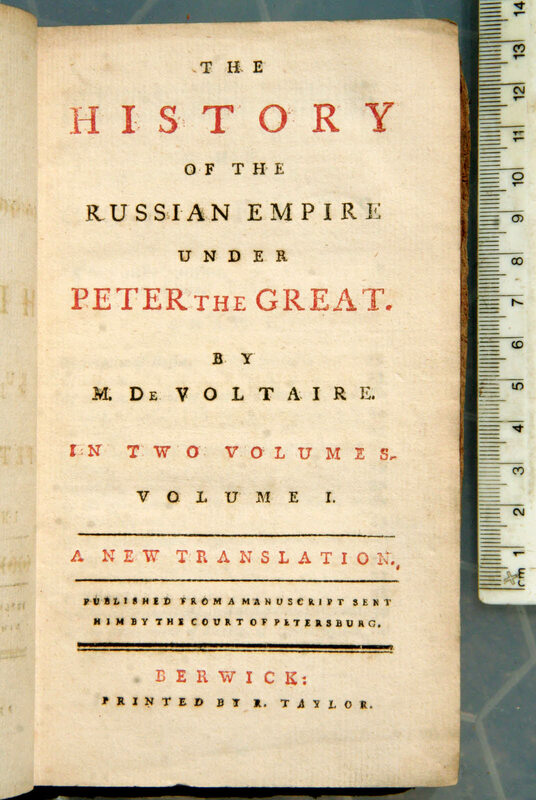 Book "j": "The History of the Russian Empire Under Peter The Great In Two Volumes" by M. De Voltaire... "A New Translation". "Published from a manuscript sent him by the court of Petersburg". At the bottom of the page: "Berwick: Printed by R. Taylor". Sadly, I have only the first volume. My copy has "John Pope's, 1770, Hollinghurst" written on the first endpaper. Other than that, with a quick check, I could find no indication of publication date or translator's name. No joy... yet... with Google on "John Pope", or Hollinghurst as a place. http://www.worldcat.org shows three copies thus, publication date uncertain... thought to be in range 1760-1770. Wikipedia gives the date of publication of the French originals of volume I and II as 1759 and 1763. "Captain Cook's Voyages". Sadly, this was either printed in a very boring manner, or the title page and frontis are missing. There is the remains of a plate, with half of half the globe showing. (Australia). The book belonged to "John Thistlethwaite, 1769".... which is odd, given that Cook's first voyage started in 1768 and the ships returned after the third in 1780! A lysdexic 1796, maybe? 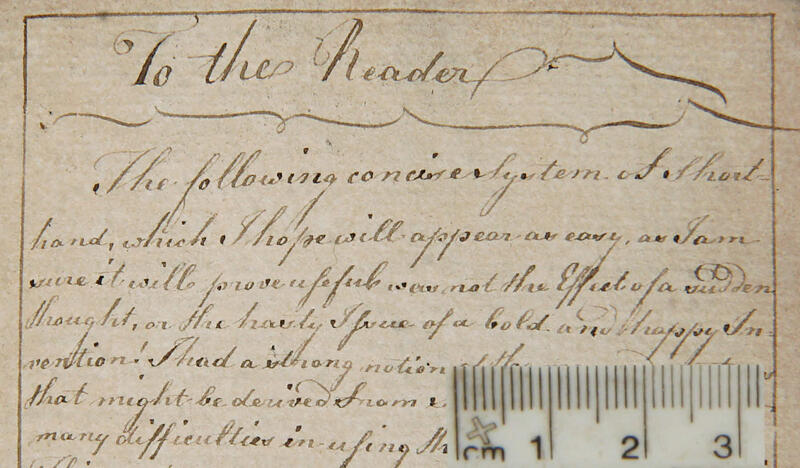 But... stranger and stranger, John put his name and "1769", in a very clear hand, inside both the front and back boards. 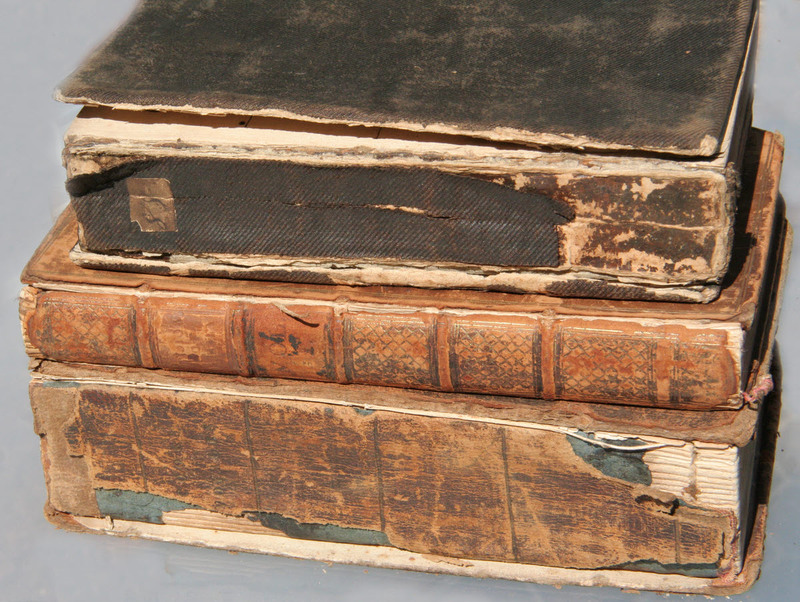 Maybe old boards were used to bind a (then) new book? The book covers Cook's first, second and third voyages... rather unevenly: The first is dispatched in pages 1-26, the second gets pages 27-76, but the third gets pages 77-634... where my copy ends, although it seems there were more pages following the last I have. Oh well. There are quite a few nice plates! It is 176 mm high. There are, of course, many editions of "Cook's Voyages". This one has a one and a half page preface (unsigned), and a three and a half page "Memoir of Captain Cook", also unsigned. I couldn't find an Abebooks listing for a book giving accounts of all three voyages in a single volume. So there you have it... my "haul" of "goodies" from the auction. 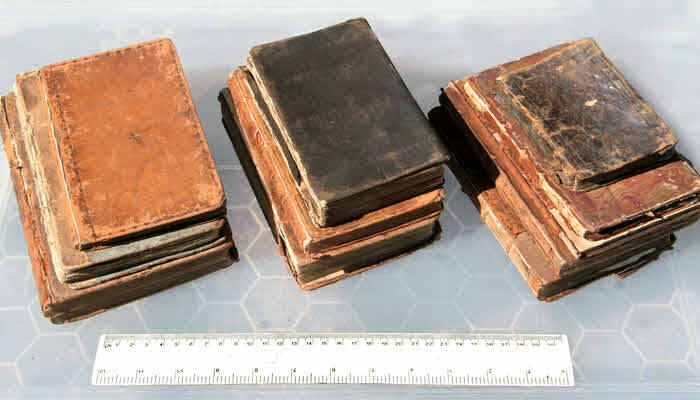 Nothing terribly valuable, due to the condition of the books. But fun. The first two... who knows? No copies of the Cocker's Dictionary are listed at Abebooks at the moment. At http://hockliffe.dmu.ac.uk/items/0524.html, it is said that the third edition came out in 1724. 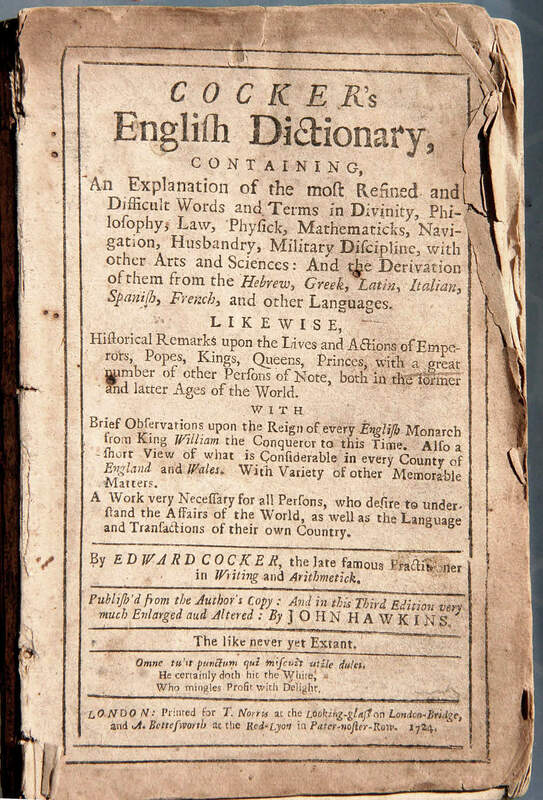 Samuel Johnson's "A Dictionary of the English Language" only appeared in 1755, so perhaps the Cocker would have been worth something, if not in poor condition. The third edition Locke, and the "Gentleman's Calling" would perhaps fetch £1000 each. The "Cook's Voyages"? Hard to say, given that I couldn't find the book offered in the form I have. A guess? £500. 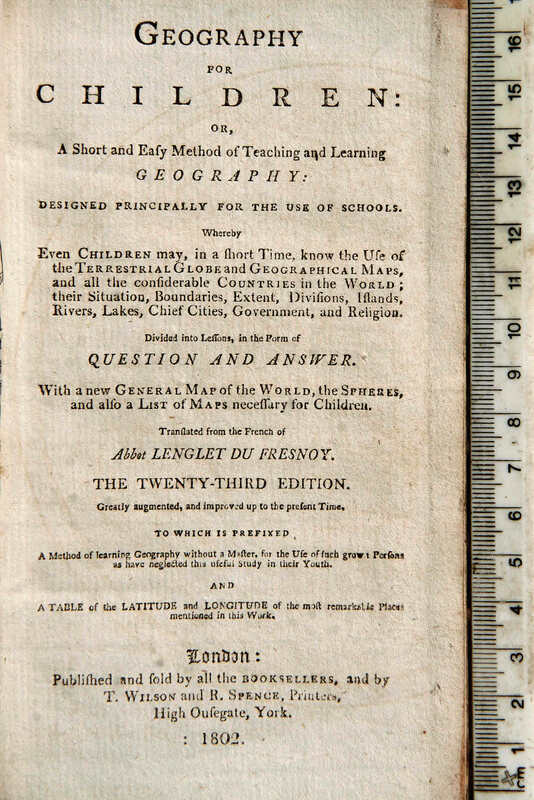 A good copy of the "Geography for Children" might be worth £300, and Wilson's "... Surveying...", even with Hume's "Geodoesia...", in good condition, might be worth £200. .... and the others would only be worth around £50. Add it all up, leaving out the first two and the Crocker, and you get £3,150... asking price. Mostly the highest asking price. But I still enjoy having the books, even in poor condition. Just the analysis of the job lot was fun! Their poor condition is almost a bonus. I have some books which I am reluctant to handle... not a problem with the books described here! I have other pages with tales of old books and maps, if you are interested. Want to look closely at some image? To zoom in on just bits of it? I explain how, and give some other browsing tips on the linked page. Editor's email address for comments or questions.